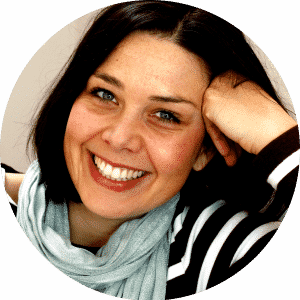 Why – you may ask – would I want to put them into the lye solution rather than the more traditional approach to infuse them in oil? Well, cold oil infusion takes 6-8 weeks and even heat oil infusion takes 2-4 hours on the stove – Mama ain’t got time for that. I also thought this could be an easy way for beginners to get a good color result. So, the first experiment I did was with Brazilian pink clay. I added 1 tsp to my hot lye solution, soaped as I would normally, and gelled the soap. The result didn’t necessarily blow me away at first, but after a while the muted pink shade really grew on me. 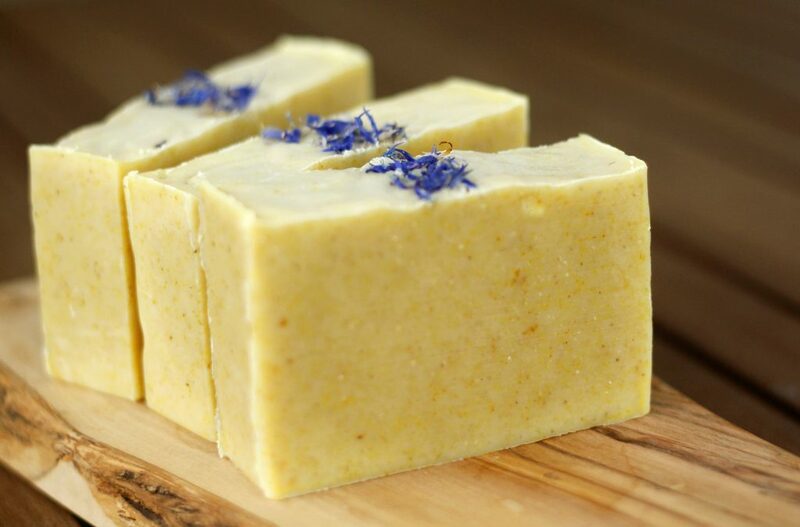 For my second project, I wanted to achieve a bright yellow color to contrast with the blue cornflowers I was going to deck the soap out with. What I did was add dried calendula petals straight into my hot lye solution. Well, what I got was a brownish orange. That’s not what I wanted! But why did this happen? 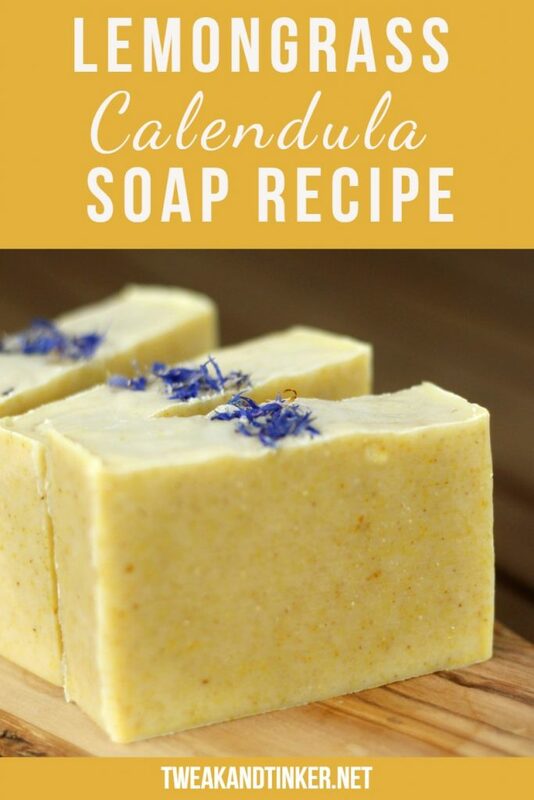 To help solve the mystery, I asked around in an amazing facebook group I’m part of and one very helpful member gave me the answer: calendula flowers turn into a brown color when added to hot lye or even hot water, but when added to your warm oils they will stay yellow. Aha, who knew? So, that’s what I did and boy what a difference it made. Want to give it a go yourself? Let’s get started. 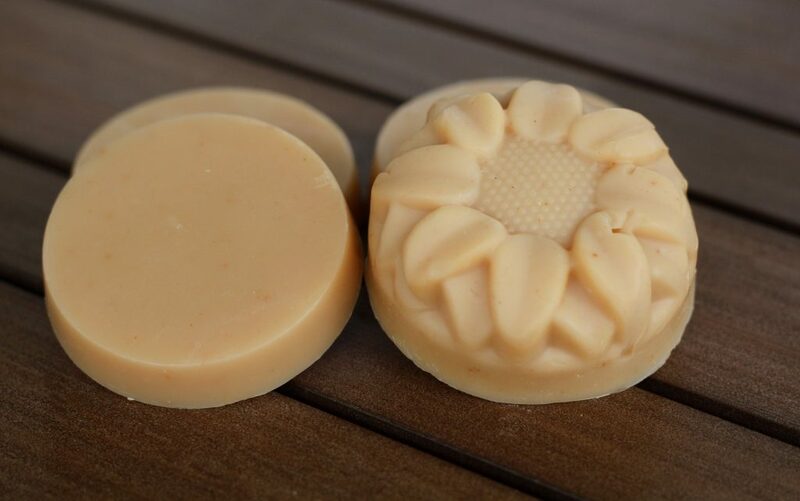 Choose a soap recipe that produces a white bar of soap. For that reason I’m choosing a high percentage of canola oil in this recipe, but tallow, lard, palm and I’m guessing babassu oil works well, too. Gell your soap! The color will pop a whole lot more if you do. 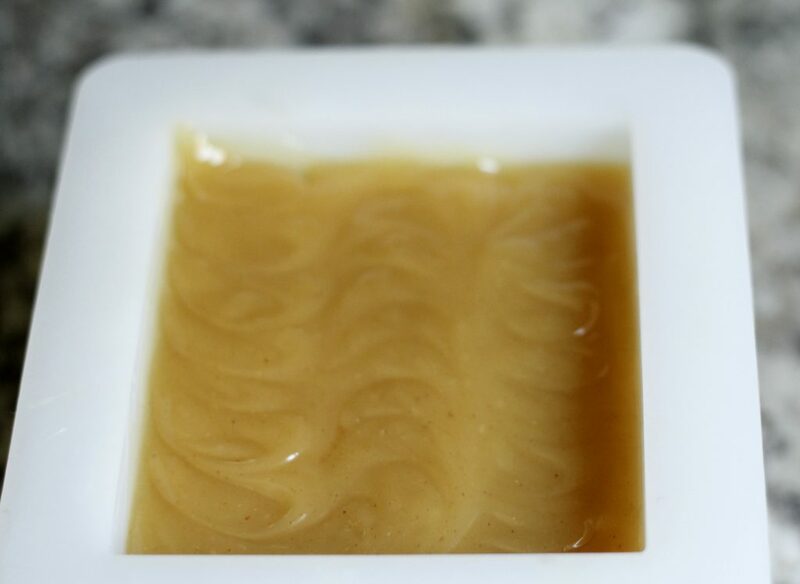 If you’ve never made cold process soap before, I highly suggest you check out my posts on lye safety, equipment needed and my beginner tutorial before you start. This recipe is sized for a standard Crafter’s Choice loaf mold which holds around 44 oz. of soap. (I made a 1 lb test batch which you can see in the pictures). You can resize the recipe to your heart’s desire using soapcalc. Disclaimer: This post may contain affiliate links, meaning at no additional cost to you will I earn a commission if you decide to click through and make a purchase. 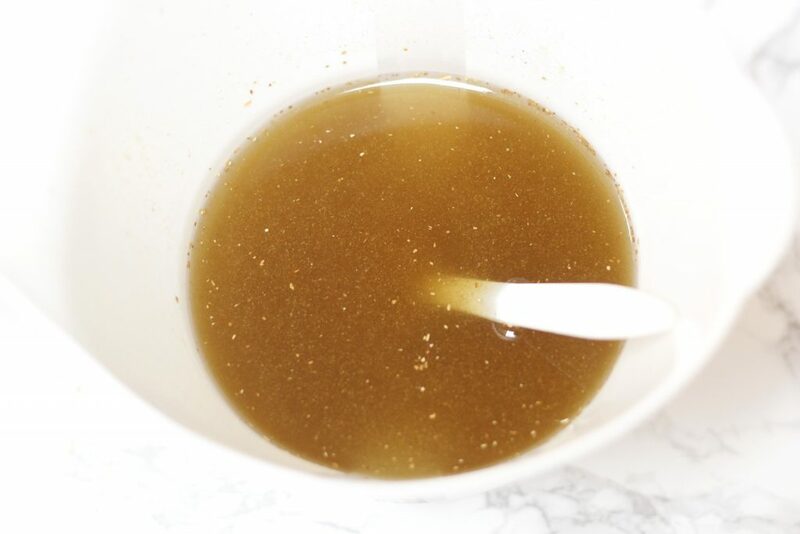 I superfatted this recipe at 5% and I’m using a lye concentration of 38% which I find greatly helps reduce soda ash. 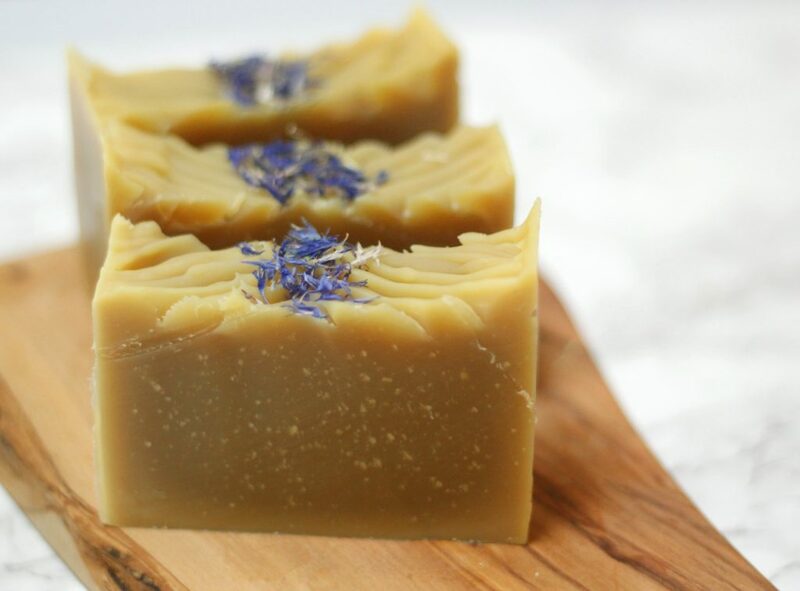 Make sure your batter has a very thick consistency before gently pressing cornflower petals down the middle of your soap. This will prevent your cornflowers from going brown after the saponification process. 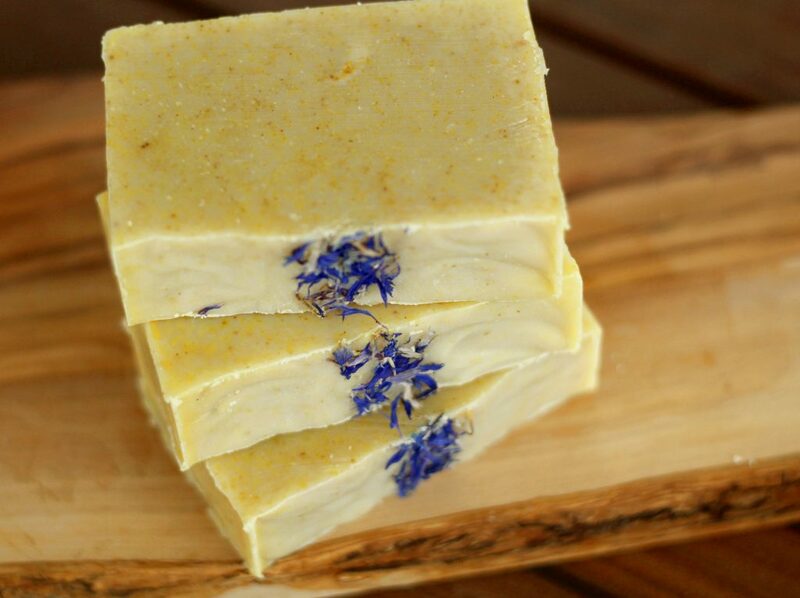 We all know that natural colorants, botanicals and essential oils can change over time. 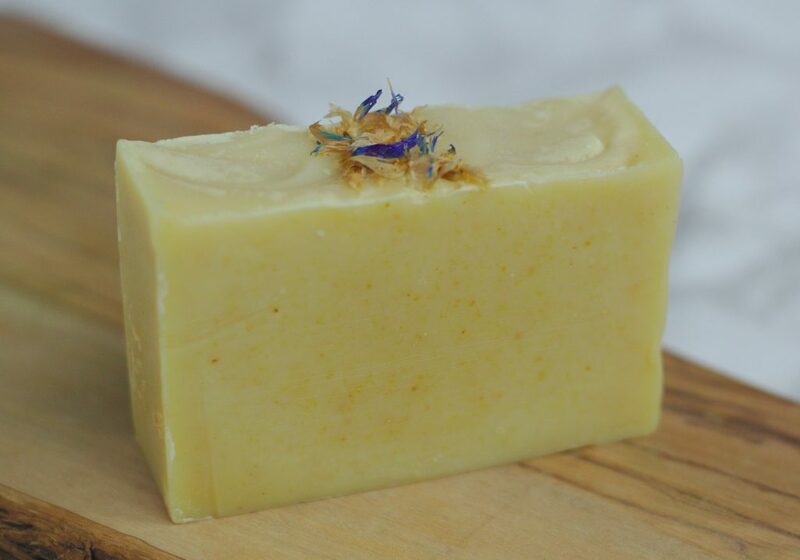 This is why I wanted to show you how this Lemongrass Calendula Soap has faired since it was first poured more than 9 months ago. Some of the conrflower petals on top have sadly lost their blue color and turned yellow. They stayed nice and colorful though for the first 4 – 5 months. Now to the scent: To be honest I never had any type of lemongrass essential oil fade on me before – ever. So, no big surprise here: the scent is still going strong and it’s really nice. I think this little soaplet is a keeper! How about you?